Fujifilm X-T3 (Amazon/ B&H/ Adorama) was officially announced in September 2018. It is an enthusiast SLR-style mirrorless camera with a new 26MP BSI CMOS X-Trans sensor and updated hybrid AF system with 425 phase. If you are looking for recommended lenses for your favorite Fujifilm X-T3, you can read below. The best wide-angle lens for Fujifilm X-T3 is the Rokinon 12mm f/2.0 NCS CS lens. It is a prime wide-angle lens designed for APS-C sized image sensors, providing a 35mm-equivalent focal length of 18mm for architectural, interior, and landscape images. The weather sealed Fujifilm XF16mmF1.4 R WR and XF 23mm f/2 R WR lens are another great two prime Lenses for Fujifilm X-T3. Fujifilm XF35mm F2 R WR (53mm in 35mm format equivalent) lens is the best portrait prime for Fujifilm X-T3, offering a maximum aperture of F2.0 and giving users a superior prime lens which delivers the sharp images with great bokeh. 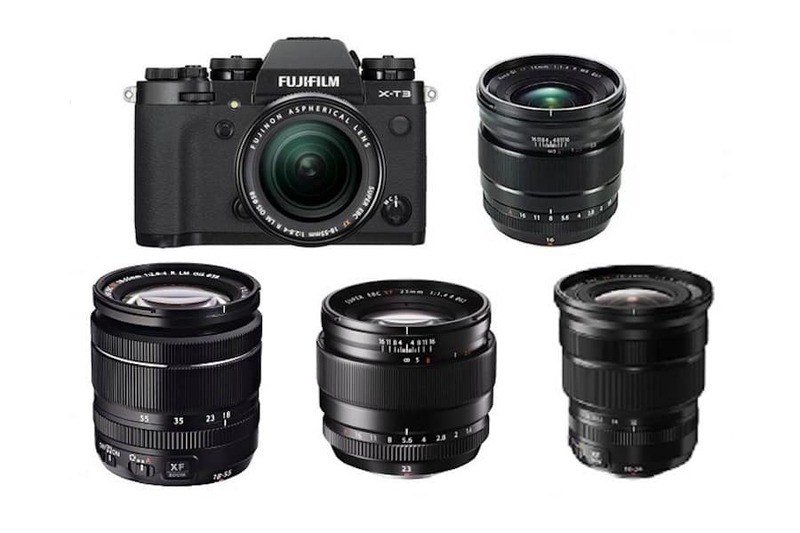 FUJIFILM XF 10-24mm f/4 R OIS Lens is the best wide zoom lens for Fujifilm X-T3, boasting an angle-of-view range similar to that of a 15-36mm lens in a 35mm system for architecture, landscape and street photographers. Fujifilm XF 16-55mm f/2.8 LM WR lens is the Kit Lens for Fujifilm X-T3. Fujifilm XF 50-140mm f/2.8 R LM OIS WR is a pro-grade telezoom lens for Fujifilm X-T3 with excellent optics and a tough, weather-resistant build. Fujifilm XF 55-200mm lens is a fantastic lens for spots, action, race, portrait and wildlife shooting. Fujifilm XF 100-400mm F4.5-5.6 R LM lens is the ultimate choice for wildlife, sports and outdoor photographers.